QC-Track®.ApronsTM can handle tracking needs from single room facilities through multi-site multi-department hospital networks. In QC-Track.Aprons, items of PPE are tagged with a QC-Track.Aprons Tag, and associated with a Department. The Department Dashboard shows the QC status of any item of PPE in the department, sends email alerts when QC is coming due, and shows overdue QC situations. 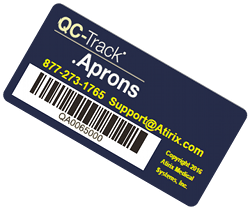 New aprons can be added at any time to the QC-Track.Aprons system. Simply add the Tag and scan it. If the Tag is not in the system you are given the chance to add it. All data entered into QC-Track.Aprons is stored in the QC-Track central QC database. QC Dashboard shows the status of Apron QC in the Department or by device. Departments can be on different QC schedules. QC Alerts, including email and dashboard notices, are triggered prior to the QC due date and if a scheduled QC activity is overdue. QC Worksheets are pass-fail worksheets to log the inspection status of each apron. Users scan the Barcode on the Tag to bring up the worksheet, saving data entry time. Failures and out-of-service conditions are logged and tracked. Barcode scanning can be done from any QC-Track workstation. QC Reports show Inspection Status, Apron Inspection History, Missing QC, and Apron lists. Generate reports by Department or across Departments. Reports are generated as PDFs to print or email.